ALL OF US HERE AT LUXEVO VACATIONS have two very important things in common: we all KNOW and LOVE travel. I guess you could say it’s part of our job requirements. We’ve been trained in luxury travel, so we understand all of the very different aspects of each resort to fit your needs. For instance, we know that not everyone has the same idea of their “dream vacation.” Maybe one person wants to spend all day relaxing on the beach, while the other wants attend every tour or yoga class on the schedule, or spend the whole day at the bar. We are all created differently, everyone is diverse and has dissimilar hobbies. But, at El Dorado Spa Resorts by Karisma, there is literally something for everyone! Experience El Dorado Royale, Casitas Royale, Seaside Suites, Maroma, and the Palafitos. These resorts can satisfy all of your different personalities! 1. Fun in the Warm, Mexican Sun! Whether you prefer natural or man-made bodies of water, El Dorado Resorts has you covered! There are numerous pools hosting swim-up bars or if you prefer to be surrounded by the white sand and the turquoise Caribbean Sea, these resorts are all located with beach front views. 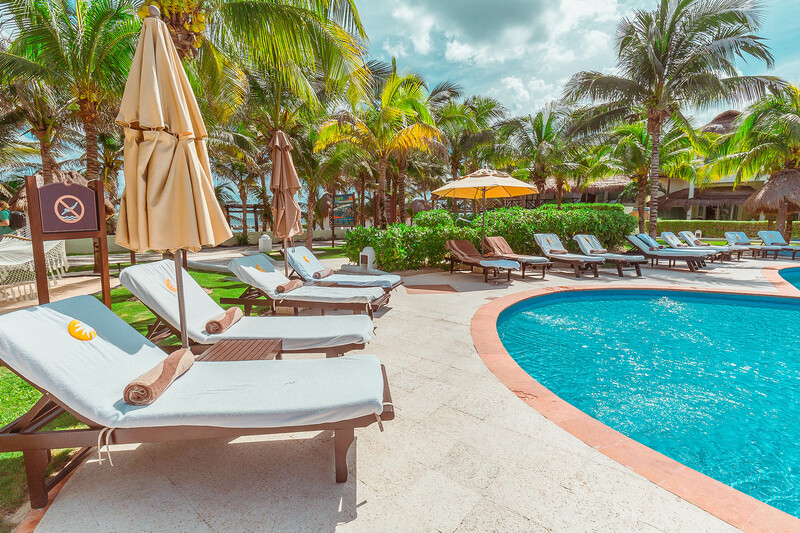 The pools and beaches are both home to butlers, cabanas, lounge chairs, and your own paradisiacal oasis. Whether you like to lay out and work on that impressive tan, flip through magazines, read a book, sip on tropical cocktails or local beer, or maybe just relish in the fact that there are no screaming, crying kids to be heard or seen anywhere… These adult only resorts are perfect for you! 2. Kayaking, and Horseback Riding, and Scuba Diving, Oh My! On the opposite end of the spectrum, you have the young-at-heart-no-matter-what-age-adrenaline-junkies who can’t sit still! No worries, friends. These resorts offer over twenty different adventure-filled activities to choose from! If you enjoy being in the Caribbean Sea, seek out kayaking, paddle boarding, snorkeling, scuba diving, fishing, take a ride on catamaran, parasailing, riding wave runners, water volleyball, or you can even interact with dolphins or watch sea turtles hatch on the beach! If you’re interested in adventures that keep you on land, check out horseback riding, ride exotic camels on the beach, go on a bike tour throughout the resort grounds, or take an off-grid excursion! 3. Relax, Refresh, and Replenish! If you’re a person who works hard day in and day out and believes that vacation should be filled with nothing but relaxation and rejuvenation, El Dorado Resorts is also the place for you. How, you ask? Two words: Náay Spa. Combining ancient Mayan principles of the four sacred elements; Fire, Earth, Water and Wind, with new, innovative technology to create balance in rest and renewal. This spa will work wonders to help you find your inner peace. Services include reflexology, hydrotherapy, body treatments, facials, herbal therapy, and a variety of different massages. 4. The Place Where Socialization and Entertainment Meet! If you’re a “Chatty Cathy” or a “social butterfly”, you probably aren’t the biggest fan of kicking back and just relaxing. You like to get up, get out, and move! Yes, Karisma even has activities perfect for you! These resorts offer an aqua gym, archery, rifle shooting, CrossFit, dance lessons, yoga classes, a cigar-rolling lesson, a greenhouse tour, Spanish lessons, cooking classes, a spinning class, Zumba classes, a tennis clinic, and even a towel decorating class! Not only that, but scattered throughout the resort they have five-star bars and restaurants and the kind of live entertainment meant to make you smile and get you up and dancing! Being a “Gourmet-Inclusive” resort, you better believe that Karisma has curated delicious cuisine from all around the world, made for the people who love food more than they love most people. Featuring some of the best jaw-dropping, mouth-watering eateries, there is literally something for everyone. Don’t believe me? Well, let’s see. These restaurants are home to cuisine from all around the world, including delicious Caribbean, gourmet American, authentic Mexican, a-la-carte International, contemporary Italian, and innovative Pacific Rim cuisine! If you’re looking to be wined, dined, and thoroughly entertained, at El Dorado Resorts, you will indulge in these out-of-this-world creations! I know, I know. This all sounds too good to be true. That’s what I thought at first, too. But trust me, El Dorado Spa Resorts really is this good! When I say they have something for everyone, it isn’t just a blanket statement. It’s a fact. Luxury, adventure, relaxation, entertainment, and gourmet cuisine… What more could you want? Ready to visit El Dorado Spa Resorts? Contact us today!